The Biscuits & Jam Farmers' Market opened its 2018 season Thursday, June 7th. New Albany’s Biscuits & Jam Farmers’ Market opened its 2018 season today. The Market, located in downtown New Albany on the banks of the Tallahatchie River, has changed its days of operation. The market will be open on Thursdays, from 4:00 – 7:00 PM, from June through August. 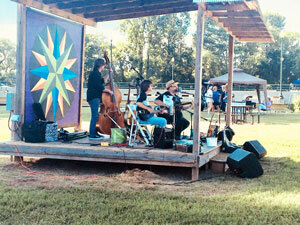 Libby Rae Watson and The Hoodoo Men kicked off the music side of the Biscuits & Jam Farmers’ Market. The market still boasts its locally grown veggies, live music and other homemade items. And, of course, lots of opportunity to visit with old friends and make new ones. If you don’t have time to stop and shop, Jam Boxes will be available again this year, beginning June 28th. The boxes, which are filled with produce from the week’s vendors, are $20, and must be pre-paid. The 3rd Thursday of every month is Children’s night. Children may go by the Baptist Memorial Hospital-Union County tent and pick up a Produce Power Chip. The chip may then be spent to buy produce available at the market. Produce Power coins are sponsored by BNA Bank.